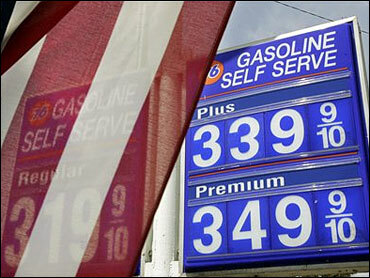 When the price of gas went to three dollars a gallon here, I didn't rush to my local gas station to fill up my car. This was despite the fact that I only had a quarter of a tank left. I wasn't in any hurry to spend that much per gallon. So I continued to drive around, not wanting to give my money to the oil companies. I guess it was my little protest. Needless to say, by the time I absolutely, positively needed gas, the price was up to $3.15. It was not the most successful protest in history. As I filled up, I watched the dial on the pump spin all the way up to $45.00. I know six months from now, we'll nostalgically be talking about the days when we could fill our cars for "only $45," but it was a shock. You know in those old movies when the guy pulls into a gas station and says to the attendant, "Give me a dollar's worth of regular, please?" How much gas would that buy today? A drop? Maybe there's a silver lining here — employment. If prices keep rising like this, each gas station is going to need a full-time guy on that ladder changing the price on the sign. I just hope he doesn't have to drive to work. My daily commute consists of walking from my house to my office above the garage. But even someone who drives as little as I do feels the price of gas is getting ridiculous. Obviously I feel sorry for those with long commutes and even worse for people who drive for a living. I feel the least sorry for those who have giant SUVs and drive alone. But maybe I'm being too harsh on those who choose to have a car bigger than Delaware who don't fill it up with people. It's a cultural thing — especially in California where I live. People are encouraged to carpool, and those who do get to drive in special uncrowded lanes on the freeway. Still, most of those SUVs seem to be empty except for the driver. Here in California, and probably in the rest of the United States, cars are very personal. Maybe they are just "things" to people in other countries, but many of us are very attached to our vehicles. Some people no doubt feel that to suggest that they share their car with five other people would be like suggesting that they walk around sharing their pants with five other people. It's just not something they'd be comfortable doing. Using France's economic system as a positive example is probably not a good idea in most areas. However, there's one thing they do that warrants a thought. In France, jewelry and other luxuries have all kinds of taxes attached to them, helping to make them very expensive. But the government puts a limit on what a baker can charge for bread. If you think you make the best baguette in France, you still can't charge whatever you want. In their culture, bread is considered a necessity, and, therefore, the citizens shouldn't be gouged when buying a loaf. Well, to many in our culture, gasoline is a necessity, and we shouldn't be gouged, either. If private industry doesn't police itself, maybe the government will have to put a limit on gas prices. Or at least with every fill-up, give us a free loaf of bread. Spokespeople for the oil companies can say all they want about the marketplace, crude oil prices, etc. But why are their profits going up and why are their executives getting huge bonuses if they're just passing along their increased costs to us? I guess what I'm saying is that I can't help feeling it's a little hard to justify the fact that gasoline prices have probably gone up just since you started reading this column. Lloyd Garver writes a weekly column for SportsLine.com. He has written for many television shows, ranging from "Sesame Street" to "Family Ties" to "Frasier." He has also read many books, some of which cost more than a gallon of gas.